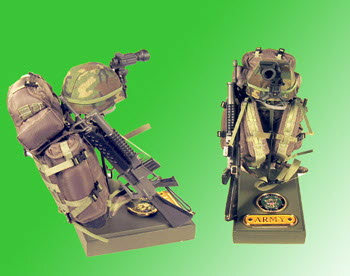 Back pack w/helmet and night vision w/ M-16 [DSK-336] - $107.50 : Metalcraft by Blair - military gifts and memoribilia. This is uniqe, it has a military back pack and helmet , the helmet has the night vision sys attached. Also included is the soldiers M-16 with M203 grenade launcher. The base shows U.S. Army pinand name plate but we have the four major branchs also available. What a way to say thanks to some one or congratulations on your promotion or simply a job well done. If you wish we can substitute an engraved name plate for the military pins.